If you are a lone shooter or just a couple of people making up a video company, between you and me you are a ‘run and gunner’. I’m not sure if that moniker will catch on, but it’s an apt description of any professional video production undertaken by a lone shooter or small crew. A medium to large production company will show up to a venue much like any S.W.A.T. does–as you’ve seen in any number of police dramas. You and I however arrive to that same venue with a 6 shooter on our hips and have to accomplish the same task–and usually in less time. That stands to reason because there’s no vast chain of command, no truckloads of equipment to unload, set up, break down and reload, no large crew to feed, and few if any round-table discussions, meetings or negotiations. And no internal politics. On the downside, the whole shebang rests firmly on your own shoulders along with full responsibility for it. Worse, the client will want the video to be as good as the one produced by the ‘SWAT team’. Well guess what? You can do it and that’s what this book is about. As in any field, there are core principles which, when applied, give predictable professional results. There are good car mechanics and bad ones. There are good videographers and bad ones. The difference is an understanding and skillful application of the basics. With that, experience gradually breeds confidence and judgment. 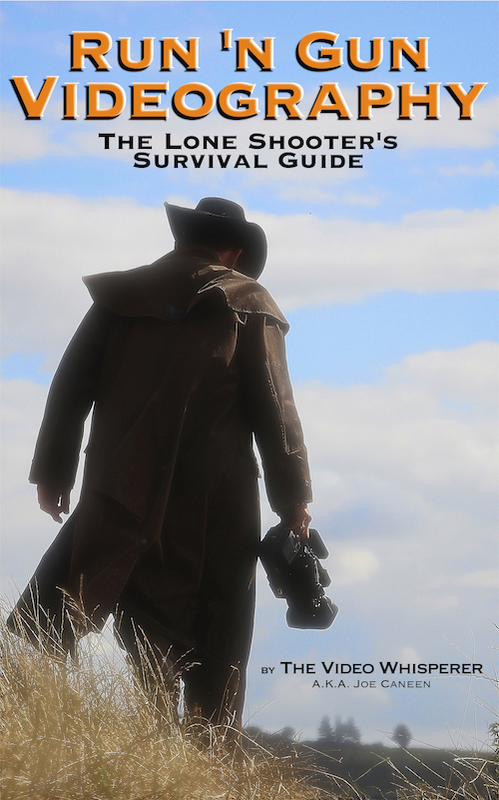 Run ‘n Gun Videography–The Lone Shooter’s Survival Guide gives you the fundamental basics in a simple and easy-to-understand way that is instantly applicable. That is not to say it is not a vast technical and artistic subject that couldn’t as easily be explained in a book ten times its size. But it is to say that this is the distillation of what is important and what all the rest is based upon. The book doesn’t pretend that you can compete with the ‘cinematic’ look produced by larger crews and the array of equipment they have at hand. But it doesn’t say that you can’t either. The dirty little secret is that there are far more important things to videography and cinematography–or the ‘cinematic look’ for that matter–than specialized equipment and techniques. Too often these fancy cinematic productions are poorly done or done for the wrong reasons. This book will help you get your priorities straight and set you on a positive path toward the ability to produce professional results with a fraction of the crew, equipment, overhead and time. But that’s all it can do–set you on a positive path. It’s not to say that there is no hard work involved and it’s not to say you won’t make mistakes. I still do. But it is to say that if you understand and apply these fundamentals, you will arrive much sooner to the place you want to be. Thank you so much Mr Joe.. FOR A PROMPT REPLY AND I GOT MY BOOK BACK AGAIN..I CAN’T THANK YOU ENOUGH FOR ALL THE WISDOM YOU HAVE PASSED ON TO US . ONCE AGAIN THANK YOU Mr JOE …GOD BLESSED. ANYBODY WHO IS READING THIS I WILL SIMPLY SAY PLEASE BUY THIS BOOK YOU WILL GAIN YEARS OF EXPERIENCE AND VALUABLE INFORMATION . If you changed computers, simply download the free Kindle app onto your new computer using the same email address, etc. Your ‘library’ (any book you purchased from Amazon) will still be there. You’ll find the Kindle app link by google search or right there on the page where you bought ‘Run ‘n Gun Videography’. I am highly interested in this book (Run’n Gun Videography) but do not have (and do not want to have) an eBook. Is it possible to buy another digital version, e.g. a pdf document?